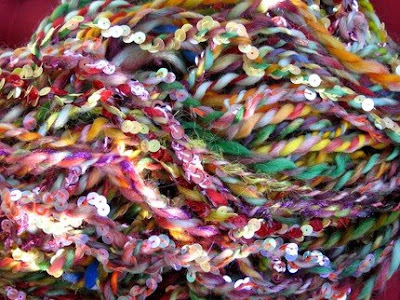 This past weekend at Maker Faire I was so happy to see my friend Amanda Jones at the Bazaar Bizarre offering her unbelievably beautiful handspun yarns. She mixes colors and sequins all together at once so even the most untalented knitter (I speak for myself here) can produce a scarf of dazzling colors and sparkle. Unabashedly girly and just prettyprettypretty. As if a kindergartner knitted something and used every color in the crayon box and threw in sequins of indiscriminate proportions. But, Amanda's work is not child's play. It takes an incredible eye for color, careful handcrafting and creative ingenuity to produce these gorgeous balls of deceptively haphazard yarn. She had a scarf sample at her table that I wrapped around my neck and refused to take off all weekend (despite Austin's heat).